As manufacturing picks up in Asia’s sourcing hubs following the Chinese New Year break, QIMA's Q1 statistics for inspection and audit demand reflect the emerging sourcing trends of 2018. 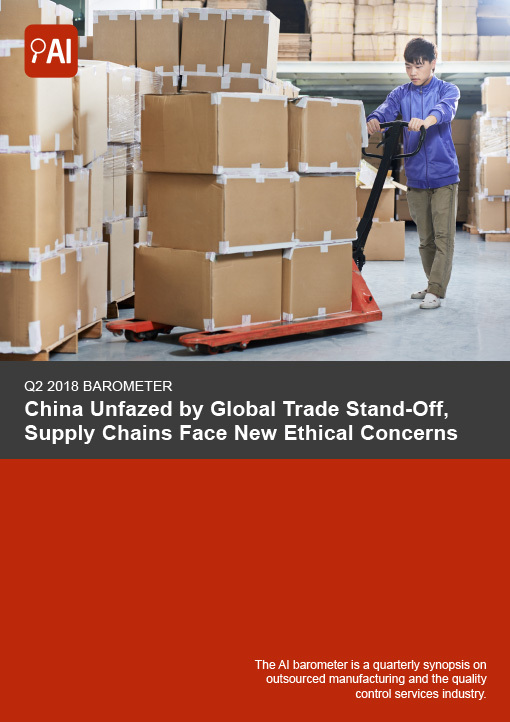 With all eyes on the unfolding US-China trade stand-off, QIMA data shows that US businesses undoubtedly stand to be impacted: as many as 73% of North American companies consider China their topmost sourcing destination and over 85% of them voiced concerns about tariffs and protectionism. In the meantime, Chinese manufacturing remains unperturbed for now, with QIMA's data for Q1 2018 showing a +5.9% YoY increase in inspection volumes, a figure to be eclipsed as regular business resumes after Chinese New Year. Growth remains robust in Southeast Asia, with Cambodia continuing to outpace its economic forecast for the second year running,i and inspection demand rising +22.4% YoY in Q1 2018. Pakistan also maintains momentum gained during last year, with inspection volumes expanding +10.3% YoY in Q1 2018. Sourcing outside of Asia maintains an upward trajectory, reflecting the ever-increasing diversification of sourcing patterns. The Latin American region serves as a prime example, with first-quarter demand for inspections and audits increasing +26% YoY. QIMA is seeing strong demand for environmental audits, especially in China where brands and manufacturers struggle to comply with the new anti-pollution laws. Pollution and waste management accounted for over 80% of non-compliances found by QIMA in Q1 2018, with over two-thirds of them classified as major. 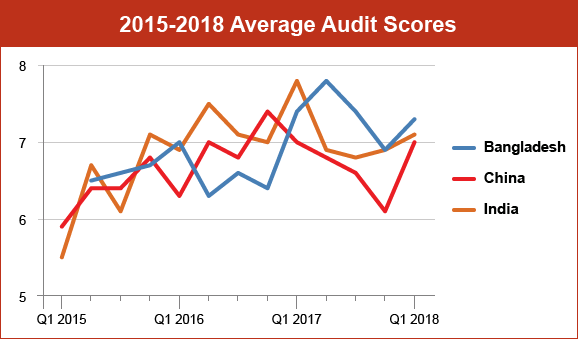 Overall ethical audit scores in Q1 2018 offer some hope for improvement after a disappointing performance last year, with a lower share of critically non-compliant (“Red”) factories compared to early 2017. Time will show whether this quarter’s data represents a positive turnaround, with lasting improvement hinging on regular follow-up and timely corrective action. Ethical scores by industry remain disparate, with Homeware in the lead (average scores of 8.3/10), and compliance in the Bodycare & Accessories sector continuing last year’s downward trend. Meanwhile, audit scores of Textile and Apparel manufacturers have been rising since mid-2017, indicating that long-term improvement efforts may be finally bearing fruit. A look at ethical performance by region indicates little change for Chinese manufacturers, with average scores flat at 7.7 out of 10. By contrast, South and Southeast Asia are showing some much-needed improvement. In particular, ethical scores in Bangladesh rose by an average of 15% during the past 12 months, likely reflecting the continuous pressure to improve put on Bangladeshi textile and apparel manufacturers by the industry groups formed after the 2013 Rana Plaza collapse. Nevertheless, QIMA data shows that factories are still plagued by Health & Safety issues, which were ranked the most pressing concern of Q1 2018, taking over working hours and wage compliance. Factory scores for Health & Safety are roughly 9% behind the aggregated average. This is consistent with the field data of QIMA structural safety audits, which indicate the percentage of factories at immediate risk is steadily inching upwards. Overall, only a third of all factories received a passing grade for combined structural, fire and electric safety, while 57% require remediation to mitigate medium-term risks. Also worth noting: the majority of critical safety violations observed by QIMA this quarter were attributable to fire safety issues. Product Quality vs. Compliance: Still a Zero Sum Game? QIMA data gathered from on-site inspections and lab tests shows that a gap still remains between visual and functional manufacturing quality on one side, and product safety and compliance on the other. In Q1, manufacturers struggled with individual aspects of product safety, especially for products aimed at the EU market. While overall compliance with REACH regulations continues the positive trend observed in 2017 (3.7% of products failing against the requirements), safety failures due to unacceptable amounts of lead have spiked to 15% in Q1 2018. By comparison, manufacturers targeting the US saw the percentage of products containing excessive amounts of heavy metals on a steady decline, reaching 2% in Q1 2018. This EU vs. US difference showed up in QIMA's 2018 Global Sourcing Survey: when asked to assess the safety and compliance of their products, around half of US brands and retailers said that their products’ compliance improved during 2017 – vs. only one-third in the EU. That said, product compliance with phthalate bans still remains an issue for suppliers to the US, especially in toys and juvenile products, with a 10% test failure rate throughout 2017, and no notable change in the first quarter. 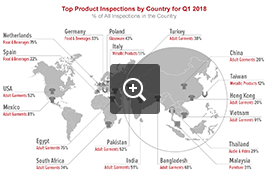 Meanwhile, data from on-site product inspections shows that in-factory quality continues gradually improving in the long term, with 22% of inspected consumer goods falling outside of acceptable quality limits in Q1 2018. This trend, however, is not universal, as made-in-China manufacturing quality appears to be suffering: after decent performance in 2016, failure rates have been rising throughout 2017. In Q1 2018, some 23% of products failed inspection in-factory, a 7% increase in quality failures – not surprising, considering that factories traditionally struggle with labor shortages around the Chinese New Year and may be forced to cut corners to meet delivery schedules. 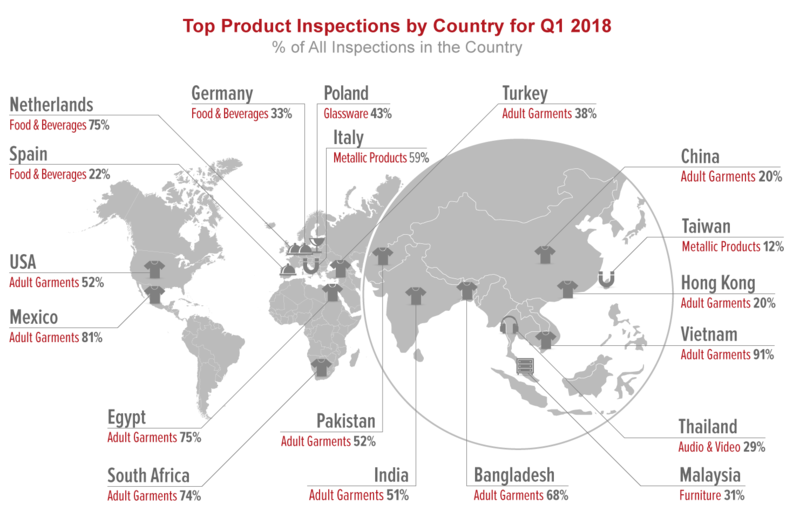 The Textile industry, despite notable improvement in the long term, retains the highest failure rates for product inspections: in Q1 2018, 28% of all textile products were found to be outside of product specifications. 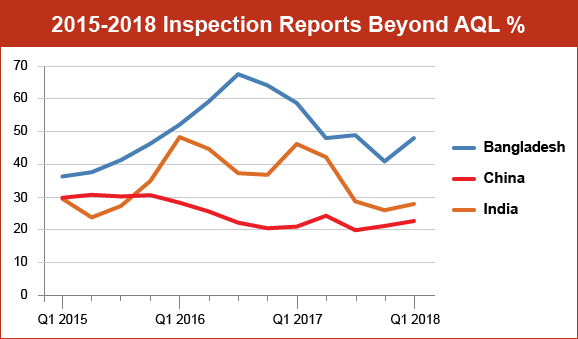 Meanwhile, the more technologically advanced E&E industry remains among the best performers, with only 18% of inspections in Q1 2018 returning more defects than allowed.